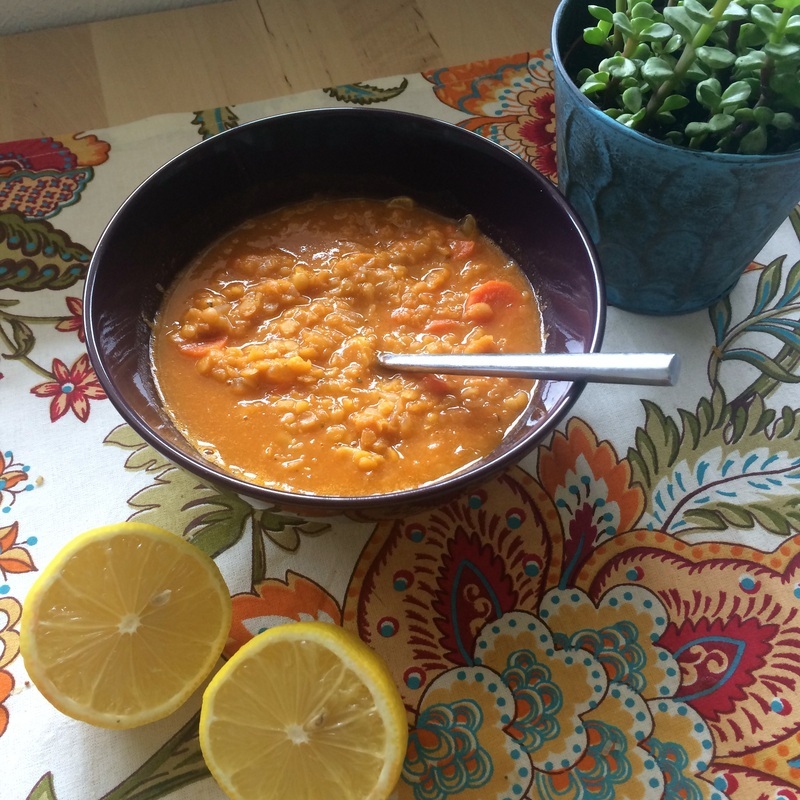 Red Lentils are a pitta and kapha pacifying lentil, that when paired with the grounding energy of carrots, the carminative effect of the sautéed onion, and the digestive power of cumin gives you a delicious tri-doshic soup that you can make in minutes. This Turkish Red Lentil Soup recipe comes from the Whole Foods recipe site originally. Below is my take on this easy, nourishing dish. I make it in my slow cooker, but stove top would be almost as easy. Brown onions and garlic in ghee or other oil (my slow cooker has a brown function, this is a single pot meal for me). After onions and garlic are nicely browned, add carrots to cook for a few minutes. Then combine lentils, broth, tomato paste, cumin, and cayenne and adjust to slow cook setting. Simmer until vegetables and very tender and lentils begin to fall apart, about 25 minutes. Optionally, use an immersion blender to slightly blend the soup until it is creamy but not completely puréed. Add salt and serve with lemon wedges and a garnish of mint if desired. Take a deep breath in gratitude for food that nourishes you, and enjoy!